Despite the name, there is no link at all to the bombing of Pearl Harbour in this game. 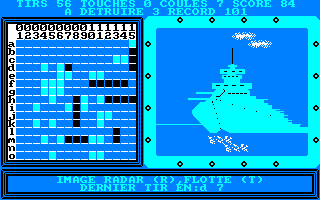 Instead, it's a computerised version of the battleships pen-and-paper game. The computer places a random number of ships on a 15×15 grid, and on each turn, you select which square you want to fire at. If you hit an enemy ship, an animation is displayed, and the aim is to sink all the ships in the fewest number of hits. To aid you, there is a radar which gives you a hint as to where the ships are located, but use it sparingly, as you are penalised each time you use it. The animations are very crudely drawn, and sound effects are limited to a few explosions. The biggest drawback is that there is no option to play a traditional game of battleships against the computer, and a one-player version of battleships isn't much fun. You must rescue your maiden and find a time machine to escape from a Middle Age hell. Well, that’s easy to say... The action is seen from above, from a bird's eye view. You must fight a bunch of soldiers, and bushes that fire at you (!). Once you’ve found your beloved, rush outside the castle and try to stay alive. Well, neither the graphics nor the overall realisation of this game are very appealing. However, it is a lot of fun to play because the difficulty level isn’t too high and it’s one of the very few games that you can complete without cheating! 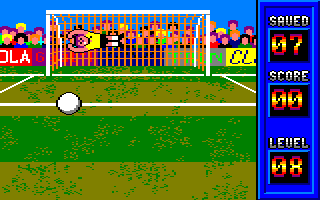 Releasing a game which is devoted entirely to saving penalties is, in my opinion, ridiculous – and if you really want to release such a game, at least make it a bit challenging. That's not the case here, as you may have guessed. You can choose to start on any one of eight difficulty levels (which are represented by eight different footballers), and on each level, you must save ten penalties before the footballer you are facing scores ten penalties. It's really easy to complete, and I managed to do so on my first go. 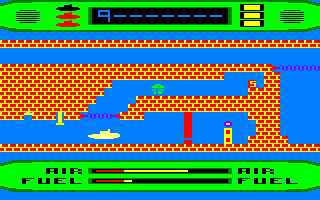 The graphics are OK, but there are no sound effects other than a whistle at the start of the game. Avoid this game totally! Take control of Penggy as he tries to push the three diamonds in each level together while avoiding the green monsters that roam around the screen pursuing him. 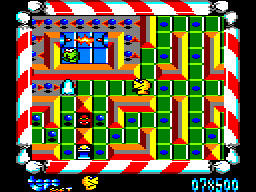 Penggy can push the ice cubes on the screen towards the monsters, which kills them, but some of the ice cubes contain eggs which allow more monsters to be generated. If you do kill all the monsters, you will go to the next level, but to score extra points, you'll have to push the three diamonds into a horizontal or vertical row. This is a Pingo clone which is rather mediocre. 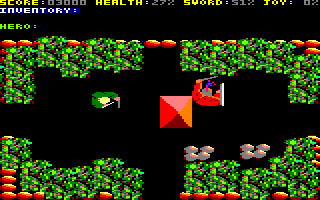 The graphics are colourful, albeit simple and flickery at times, and the game is easy to get into. However, it is quite slow, and the music can soon become very irritating. Originally released by Topo Soft in Spain as Mad Mix Game, US Gold joined forces with drinks company Pepsi to release this Pac-Man clone as part of their Pepsi Challenge advertising campaign, although there's nothing related to Pepsi in the game itself. However, there are several unusual power-ups, such as the ability to transform into a hippopotamus, allowing you to crush ghosts. 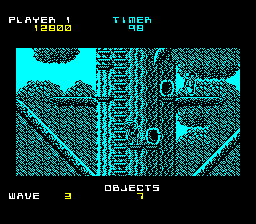 There are also tiles and barriers which force you to travel in one way only, and runways which turn you into a jet fighter and let you shoot at the ghosts and other nasties! 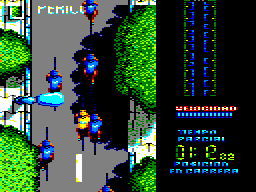 The graphics are colourful, although the music is terrible. It's a bit easy and slow-paced, but I enjoyed it, and I think the game is aimed at younger players anyway. See also: Mad Mix 2. The Spanish cyclist Pedro 'Perico' Deldago won the 1988 Tour de France, albeit in controversial circumstances, and this game sees you taking part in four stages – a race on flat terrain, an uphill time trial, a downhill race, and the final race through city streets to the finish line. The controls vary on each stage; some require you merely to move your bike left and right, while others require rhythmic waggling left and right or repeated pressing of the fire button – although thankfully you don't need to waggle very fast. The graphics also vary widely, although they are quite impressive throughout all the stages. There's no time limit on any of the stages, so you can always play all four of them without any pressure. Despite the other competitors having an annoying tendency to run into you and slow you down, this is still a very good game. A supercomputer within Britain's secret nuclear missile base has malfunctioned, and unless it can be fixed, a barrage of missiles will be launched, triggering a nuclear war. The base lies below the sea, and you must guide a submarine through a network of tunnels and collect all eight digits of the code that will shut down the computer. Your submarine is equipped with smaller scout craft that can collect fuel and keys for opening locked gates, and you'll also need to use them to locate and destroy six flashing pods that are hidden behind moving barriers. This is a very simple game with basic graphics and hardly any sound effects. There are no moving enemies to dodge, so you're not under too much pressure. However, many of the obstacles require some very precise positioning indeed, and it's too easy to needlessly lose lives. Almost everyone thinks that rats are dirty creatures, but Peter is different. He's a tidy rat who likes to clear up rubbish. 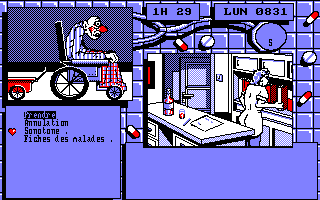 On each level, Peter must collect a certain number of objects and bring them back to the starting location. However, watch out for Riff Rat and other birds and insects; they can be stunned by throwing things at them, but if you stun a bird, you can fly around the level and transport yourself to another location quickly. Unfortunately, the time limit is rather tight, and the game is a blatant Spectrum port with everything in monochrome. The music is OK, though. Diego Maradona's 'hand of God' goal in the Argentina vs. England 1986 World Cup game was certainly controversial. This game was an unashamed attempt to cash in quickly on the hysteria at the time, and boy, it shows. Rather than being a proper football game, the only thing you get to do in it is play as the goalkeeper and save a few shots from your opponent. Moreover, your team scores goals without any input from you, although their chances can be increased by improving your skill, which involves more goal saving. Terrible graphics, terrible sound, and hardly any gameplay make this a game to avoid.